Well, finally finished another quilt. When I got back from the Sydney Show I was very motivated and after unpacking I loaded a quilt and started quilting. Took me a while as life things just get in the way all the time. But finished binding it last night. A machine quilter had shown her quilt on a list I'm part of and I just loved the look of it - so had to make one (as you do). The quilting isn't going to win any awards but at least it's another quilt finished. It has been a very long time since I have done much quilting. Too many other things get in the way and I'm getting very frustrated about that. I bought Kim Brunner's book and DVD a while back and have been itching to have a go at these feathers.....not perfect so no close ups of the quilting. I love how it's turned out. I'm pretty rusty but will keep practicing. Hi Maggie, just had to pop over and see what you are up to these days. The pyramids quilt looks awesome. I never could have guessed that you feel "rusty" at quilting. The feathers look great!! The pyramid quilt is awesome! I love the quilting. What a lot of work! Thank you for sharing. Isn't it a good feeling to cross a project off the list. Hi Maggie, Just wanted to thank you for the kind comments on my plaid quilt. Since you are a no-reply blogger I couldn't e-mail you. 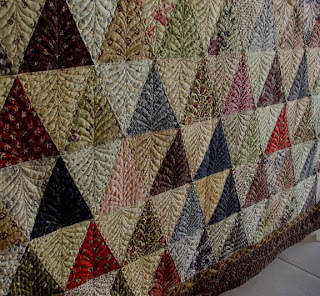 I have to say your pyramid quilt is just gorgeous and the quilting is fabulous. There is no way you can say you are rusty. Those feathers are perfect. Great looking quilt and lovely quilting! Nice job! I love your quilt so much, are the feathers difficult to do? Have not tried any free motion feathers on my machine. I would love to make a quilt like that. GORGEOUS!!! OMG....I absolutely am over the moon on this one!! WOW, I think the stitching looks wondeful. You are very clever! This is gorgeous!!! 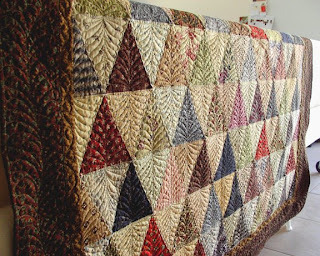 I've got a 1000 pyramid quilt on my to do list that I hope to start in the next couple months. Wow, I love the quilt and the quilting in awesome! I love heavy quilting and yours is wonderful. Thanks for stopping by my blog and leaving a comment, I really enjoy meeting new quilters and I will definately put you on my list of favorites!